Why? is much better without Hope! Why?Bike's new wheels arrived earlier this week. 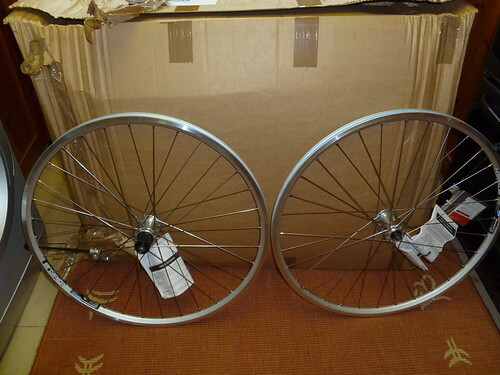 After much deliberation I'd ordered Deore LX hubs built onto Rigida Snyper rims by Andrew at Spa Cycles. Why?Bike is meant as my expedition tourer, ready and waiting for my mythical round the world tour so I had considered going for the bombproof Sputnik rims but eventually decided that these were probably overkill for my relatively light weight. When I bought my Roberts I was advised to buy a bike designed for the sort of riding I was actually doing rather than the sort of riding that I imagined I might do one day! I decided this was good advice for wheels as well – Why? is mostly used for riding to work, going out in the rain and the odd bit of rough stuff. I'd already taken the decision to use lighter tyres so I didn't want to buy unnecessarily heavy wheels. Logically I suppose I should remove the front carrier that I never use but I do like to maintain that expedition ready look! On a wet Monday morning a huge box arrived. I'd forgotten just how nice rims look before they come into contact with brake pads! 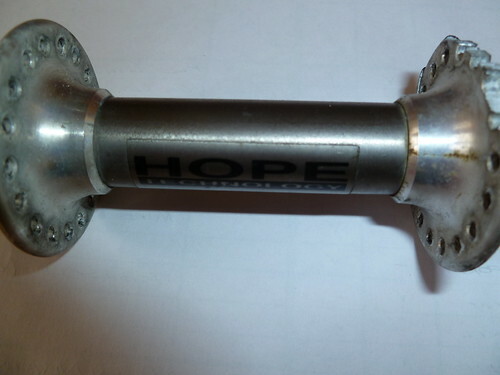 The contrast between the amount of metal on the flange of these compared to my defunct Hope hub is quite striking. 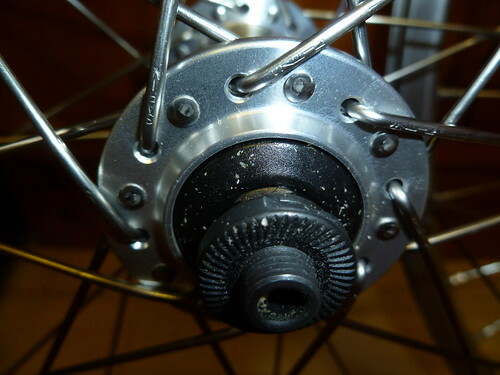 The marks on the Shimano hub are just tiny flecks of cardboard from the packaging. The marks on the Hope hub are yet more cracks! 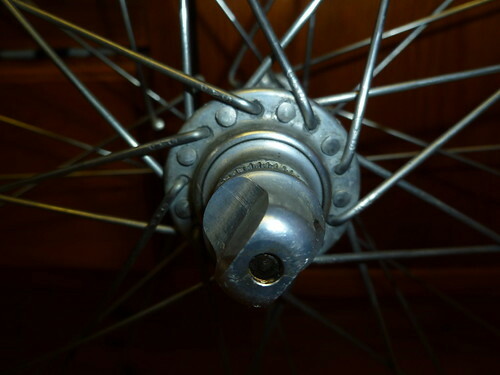 I sent the old hub to 'Brucey' from the CTC forum who wanted it for spares. He said it was the worst cracked hub he had ever seen! I hadn't been idle while waiting for the wheels – I'd been busy cleaning, polishing and spending money! I had previously been running Schwalbe Marathon 26 x 1.5 tyres on this bike but I didn't really like them. The ride felt heavy and dead and the puncture resistance wasn't as good as I'd hoped. In fact mile for mile these tyres were getting more punctures than the the much lighter tyres on my Roberts. The problem seemed to be the size of the tread which allowed large pieces of flint to become embedded. They were also hard work to get on and off. They had to go. I ordered a pair of Panaracer Paselas. I've only done about 60 miles on them so far but they have transformed the quality of the ride, they feel light and fast. They look great too! I was still using the saddle that came with the bike – a women's Brooks Team Pro. It was well broken in to someone else's shape but always felt too short to me. This is a very compact frame with a very short top tube. I felt the saddle needed to be further back but the rails were too short to allow this. I intended to get a standard B17 but when a virtually new B17 Special came up for sale on the CTC forum I couldn't resist. I did manage to sell a saddle I'd never liked to help fund the purchase! New wheels clearly called for a new cassette and chain! I did think this was a bit of an extravagance until I put a chain checker on the chain and realised that it was quite stretched. Now I could spend more money without feeling guilty! My original cassette was an 8 speed 11-26 which meant there were some quite big jumps between gears. The chainset is 46/34/24 so the gearing is quite low but I still almost never used the 11 or 12 sprocket. It was a bit of a gamble going for a 13-26 cassette but it has given me closer gears and I've not yet missed the higher gears. High speed descents aren't my thing! So, cassette on rear wheel, tyres on both wheels, wheels on bike, chain on, front mech cable tightened so it no longer rubs. But what's that horrible rattling noise? Oops! I've not threaded the chain through the rear mech properly! That was soon rectified. A quick test ride confirmed that everything is working as it should. There is only one problem. This was meant to be my bad weather bike but now she looks too nice to go out in the rain and get dirty! Ready to go round the world! Well, down the road anyway! Posted by Hilary on April 27th, 2012. Considering that Hope Technology was started by two Rolls Royce aerospace engineers who claim "technical excellence and unrivalled customer service" I still think they would have been wise to send you two new hubs free of charge (and their opinion why your old ones might have cracked – not some rubbish about spoke tension either). 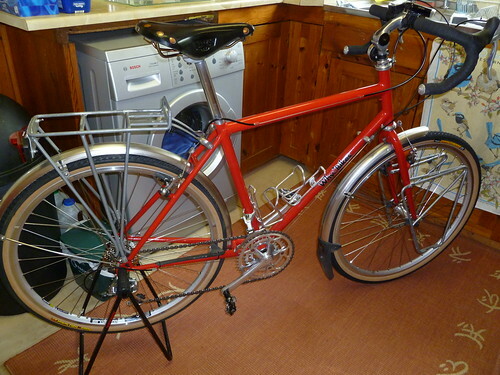 [Added] 'Brucey' is a real asset on the CTC forums – amazing knowledge about bicycles and very helpful. Hilary's photos of her bikes are always so impressive – who else keeps a bike with gears that gleam? 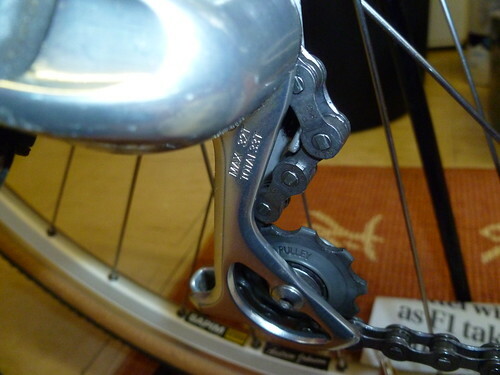 Ive done the same mistake as you have, fitted my chain outside the chain guards on teh derailer! you only do it once, when your Sram chain links cost a fiver each! who else keeps a bike with gears that gleam? LOL. You've obviously never seen Mick's Mercian!! I was very pleased with how good she looked after a bit of cleaning and polishing but my original plan had been to have a less than immaculate bike that I wouldn't obsess about cleaning! Oh well! If I ever do make it to the Karakorum Highway (which seems pretty doubtful) I really must lose this gleaming bike obsession! I was a bit reluctant to go out in all the rain we've had this week on such a gleaming bike but one of them had to do it and it wasn't going to be Roberta! At least my Paramo jacket has had some use at last! Just how long is that top tube, Hilary? There seems to be a lot of stem rising going on to get your reach right. Just how long is that top tube, Hilary? Also its a lot of faff removing levers, bar tape etc. Its definitely on the cards though! I don't think you need to remove the levers, bar tape etc Hilary. You just unbolt the clamp on the front of the stem, then the bars come off. Not so simple I'm afraid. Its the older quill type with a single bolt underneath and you have to slide the bars in and out from the side. Hilary if you do not like the stem and are not going to use it, remove the bolt completely. Then using a large screwdriver pry the clamp apart until it breaks. Fit an Ahead converter and the stem you want. No need to remove tape or brakes. Okay, I see. What Keith says then. If I was doing it I would try removing the stem and bars still together and lay them on a table (or something) so you can drive the screwdriver into the slot with a hammer. I'd have the front of the stem resting on a wooden block (hammering downwards) so you don't damage the bars. Hopefully it will fall apart like a Hope hub! Patrick the ones I have broken unintentionally and deliberate did not leave that much force. You just need the lever to be reasonably long for the power. I have never needed to drive the screwdriver into the slot as this would hit the bars. The only extra that I might consider is a small cut across the top part before it joins the main part. As I have found it is the bottom part of the clamp that breaks and the cut would help it separate slightly before breaking. It is surprising how little force is needed to break them. Keith wrote: It is surprising how little force is needed to break them. Seems a good reason to fit a new one. 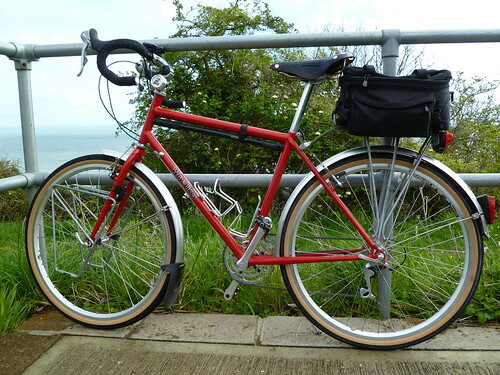 My touring bike was supplied with a clunky (and creaky) adjustable stem and I changed it – quite cheaply I think. Hmmm.....It is a possibility. I wasn't intending to go down the Ahead route, I was going to stick with a traditional quill so would need to remove tape and levers on at least one side to fit it all in. I'll give the ahead idea some thought. Keith's suggestion of an Ahead converter is a good one. They are easy to fit and the new type of stem can be fitted either way up. One way is a little higher/lower than the other. Also they have no welds – safer IMO. Just another night of insomnia Hilary. If you do not want to break the stem here are a few tips. Remove the bar tape on one side and keep it in one piece as best you can. Do not worry about the covered edge ripping to much but do try and avoid as much as possible. Mark the position of the brake lever clamp with felt tip pen. Do ensure that you have a vertical edge to line the lever up to. Remove the stem from the bike, slide the brake lever off and remove the stem from the bars. Fit new stem and brake lever. With the pen marks it is now easy to get the brake lever back in the same place. I then use some double sided tape on the rear of the bars where the tape has been removed and refit the old tape. If it is not neat I do not worry as I just put some more tape over the top to double up the tape on both sides for comfort. I would remove the stem and not break it. Then I have an adjustable that is handy for working out the height and reach needed on other bikes acquired. Preferably before the creaking becomes to worn and it moves about. Road Tax Is Dead, Long Live Road Tax!